And many more will soon be added to this list, so be sure to check back. 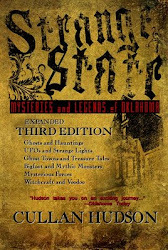 If you have any particular suggestions or request, feel free to drop us an e-mail at: s t r a n g e s t a t e o k @ y a h o o . c o m. If you are interested in picking up a copy of the book Strange State: Mysteries and Legends of Oklahoma, click on the Paypal link at the top right of this page or contact us via e-mail. Seasons Greetings, everyone! 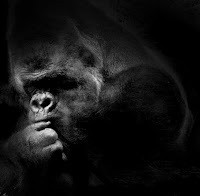 With only about 700 gorillas remaining in the wild, time is running short for this wonderful creature. Read what Anderson Cooper has to say on CNN.com and look into ways you can help with the fight to keep these and many other animals off the endangered species lists before they too become extinct. A San Juan Capistrano man hopes to make history as the discoverer of Sasquatch and hosts trips for amateur Bigfoot enthusiasts to help make the find. While I am no chuck-the-babies-out-with-the-bathwater type of person, I have to admit I agree wholly (and then some) with the following review of Loren Coleman and Patrick Huyghe's The Field Guide to Bigfoot, Yeti, and Other Mystery Primates Worldwide. Take a look for yourself, if you've read the book and be your own judge. If you have yet to read this work, this review just might convince you to wisely steer clear. 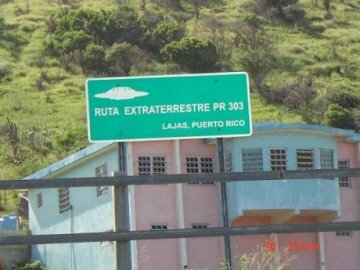 In addition to the oft-mentioned Chupacabra(s), Puerto Rico also has a long history of UFO sightings. OVNIS (the Spanish acronym for UFOs) have been regularly reported since at least the early 1970's. A particular hotspot is the town of Lajas in the southwest. In fact, it has become something of a OVNIS Mecca, much like Roswell is to New Mexico and the United States. 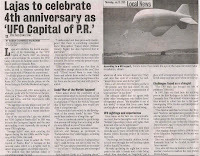 World attention was suddenly thrust upon Puerto Rico again on May 5, 1997, when reports of a UFO crash near the town of Lajas (famous for the Laguna Cartagena incidents earlier this decade) at 3:25 a.m. erupted on the news wires and on the Internet, producing renewed interest in the island's UFO landscape, which had waned since the cessation of Chupacabras activity last year. All accounts coincided on the fact that something had happened near Lajas, producing an intense brush fire in the habitually arid region, but the source of the fire became a bone of contention: one band of ufologists claimed that a spacecraft had hurtled out of the sky and exploded, causing the conflagration along with reports of Federal agents who denied the local police access into the area. To everyone's surprise, an astronomer took the side of the pro-UFO faction, insisting that a meteor of that magnitude would have left a tremendous crater, possibly obliterating Lajas and the neighboring towns. 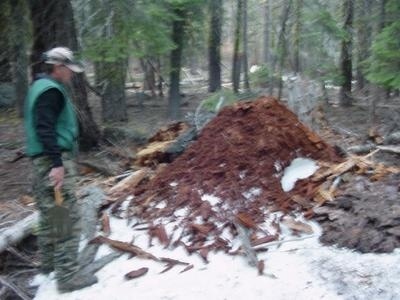 On BFRO, a recent article describes the unusual sight researchers witnessed while near Emigrant Wilderness in the Sierra Nevadas of El Dorado Co., CA - the same region where some fairly well-known recordings were made of whoops, cries, knocks and whistles of purported Sasquatches. The researchers located several waist-high mounds of snow that had been covered in woodland debris, a strange attribute they claim could only have been done by something with hands. While they agree, a human could have done it, the article goes to great lengths to rule out why that would not be probable and doesn't spend a lot of time looking first for more prosaic answers. It seems obvious they have a theory they wish to see win out. In 2005, Park Ranger, Robert Leiterman, working in conjuction with the BFRO, first spotted these unusual mounds but the group remained quiet about the sighting. 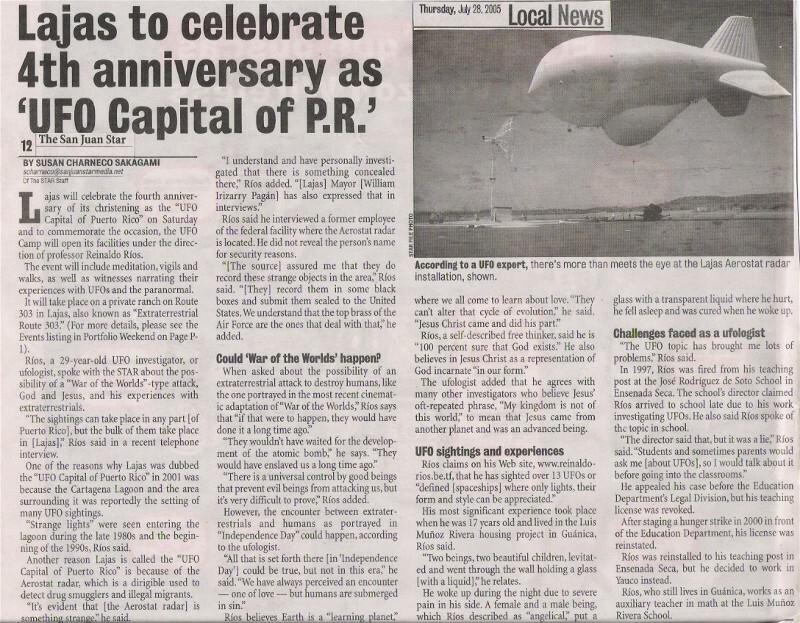 They feared copycat hoaxes would crop up in the wake of any announcement, providing an obstacle to serious investigation. It wasn't until their expedition this fall into the Sierra Nevadas when they encountered more mounds that the group felt it was time to publish their findings. Undoubtedly the BFRO will rely upon the Ranger's outdoor expertise to validate the unusual nature of these mounds. If a man like Leiterman thought these mounds unusual, then certainly they must be. 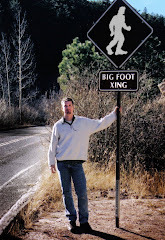 But I wonder, if a creature like Sasquatch had been traipsing around the Sierra for years, would this not have been a puzzling enigma long before? Surely, others must have seen these unusual formations. That is precisely what the BFRO hopes now to find. More sightings and data from their readership they hope will bring about a clearer understanding of both the scope and nature of this phenomenon. After the team concluded their investigation, they closed up shop by mounting motion-activated game cameras around these mounds. However, when researchers returned three weeks later, they were dismayed to find nothing had returned to the mounds, least of all any Sasquatch. The team has bandied around possibities: Hoaxers, they discount, would have had no way of knowing that the BFRO would be in that region. To paraphrase Mr. Spock, only BFRO arrogance would assume the message must be meant for them. However, I have to agree with the hoaxer theory but for a different reason. While odd, it's not necessarily a noticeable nor noteable sight. Average Joe Ranger - or whomever - is traipsing through the woods and sees this and thinks, Okay that's odd. But I can't see him necessarily coming to the a priori Bigfoot conclusion unless he had ties to the BFRO and desired to view it in the light of all things Sasquatch. They also discount that these were in anyway fashioned by park rangers (for whatever purpose) since these men and women undoubtedly have far too much to do and covering a snow mound with debris would take HOURS. I have to say, I can't see it taking more than a few minutes and if they insist on saying the mound was constructed as well, it doesn't take a seasoned outdoorsman to say that large patches of snow can be left isolated during a thaw, leaving "mounds" of snow. The one theory they present that makes - thus far - the most sense is that the vegetation was used to radiate solar energy (that would have been otherwise reflected away) to melt the snow faster. They pointed out that while there were "clear" mountain streams and ponds nearby, they most likely contained Giardia Lamblia parasites. This theory would indicate the mound builders were human since, I assume, Sasquatch would have evolved to tolerate these parasites lest it die of dehydration.